The Craft Barn November challenge is out, and the prompt words are grey and owls! After stressing with last minute takes on the October pages, I decided to start November with these -one down, two to go! Besides I have different options for owls, so the situation looks fine. There is no calendar grid for this one yet, because I will draw it behind the December page once I do that. The October calendar has been updated with it's grid (that is behind this one). Sorry for the bad light in the pictures, I'm working to find a solution, there's a long winter ahead! 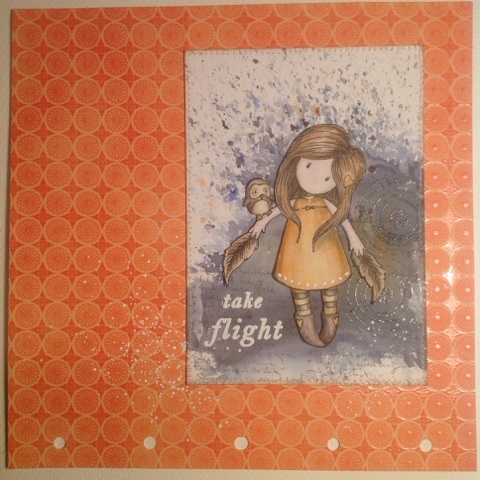 I chose to start with a Gorjuss stamp and Grey Brusho. 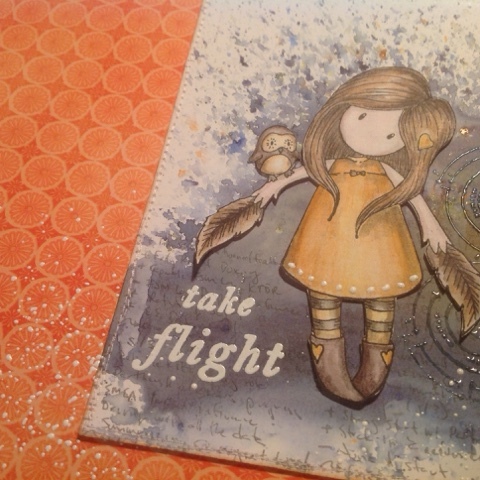 After getting the brusho on the card I picked out the orange background (there are orange specks in the brusho) and coloured the girl orange too. I'm loving the cheerful combination. I stamped a text stamp with grey Archival and heat embossed the sentiment in white and noticed that the circle thingy on the same Paperartsy stampset (ESN15) had a central image that resembles the motive on the background cardstock... so I had to stamp that too, and heat embossed with clear embossing powder. 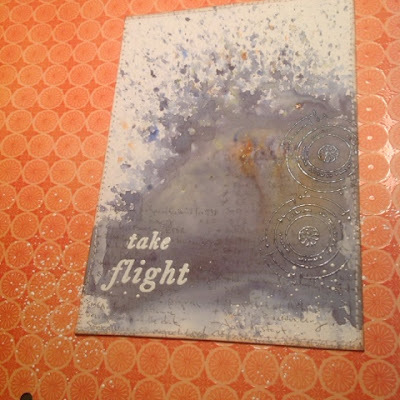 I wanted to add something to tie the "photo" to the background, so I sprinkled chunky embossing enamel around. Since it wasn't bonded to anything, I heated from underneath. The girl was coloured with Inktense pencils and a waterbrush. I used an embossing pen to add dots on the hem of her skirt, embossing with the chunky white. She was mounted on low foam tape. what a pretty page, the background and main image work so well together. 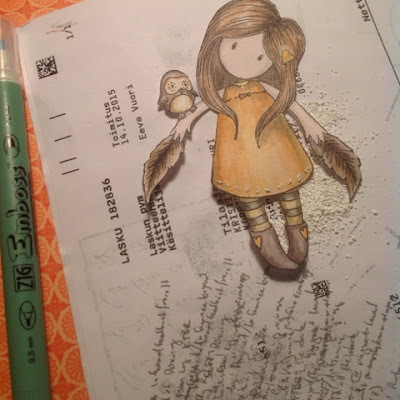 Beautiful colours here, I do so like Gorjuss Girls and the little owl is so cute! Thank you for entering The Craft Barn's Calendar Challenge. Fabulous Brusho background and the colouring of the girl is amazing.